I had another consult with a client of mine. I had done a "room re-design" over a year ago. 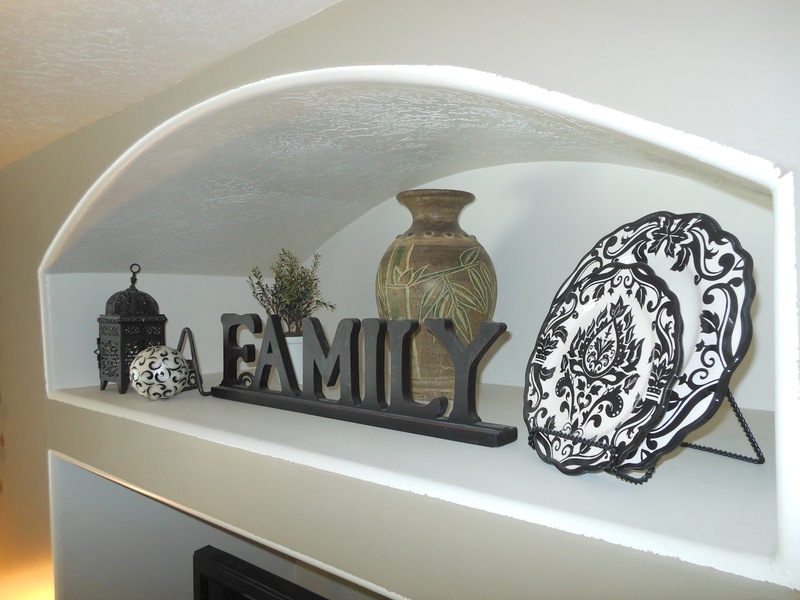 She was ready to paint and add some design elements to polish her family room. She did the "One Hour Fix", I basically gave a one hour consult of things she could finish on her own. A great option for those who don't want to spend a lot on a room. The paint color we chose was Lowe's Oyster Shell. Its a really warm "greige" color. It is a cooler beige with a hint of gray to it. It is a was a perfect color to add to this room. We put up cream linen curtains with black details, which are a perfect shade against the walls. 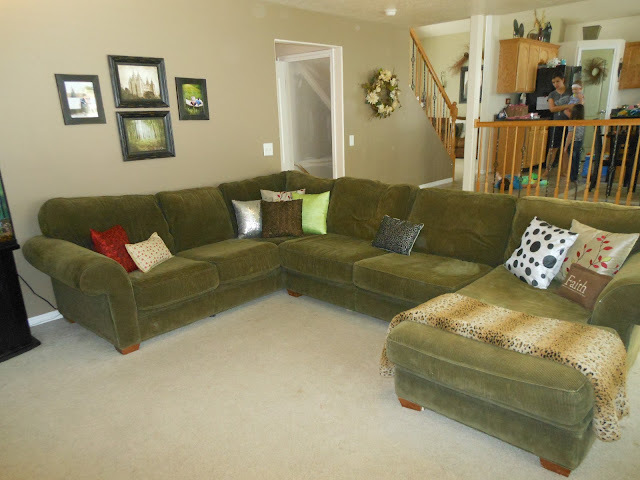 The pillows chosen are mixed up of nuetrals with pops of red, paired perfectly with their olive courteroy sectional. 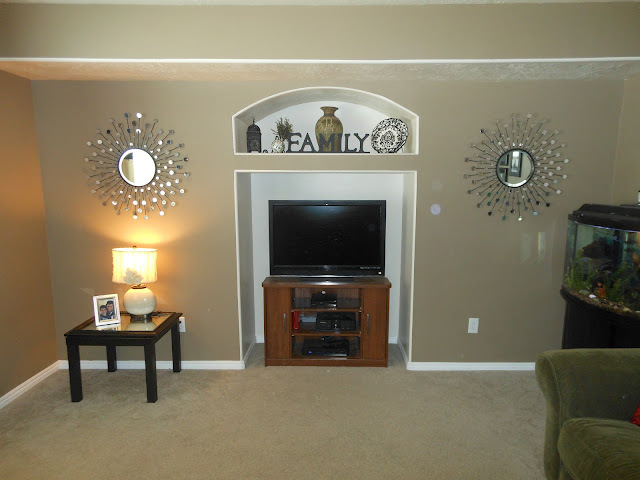 The fun sunburst mirrors add a perfect amount of light to the focal wall, adding the right amount of pop with out being overwhelming to look at since its on the tv wall. A new entertainment stand was purchased that is the perfect scale and size for the recessed wall. We also didn't paint inside of the recessed area to add a little bit of interest. Had we painted inside it would have felt a lot darker. Its a nice contrast. 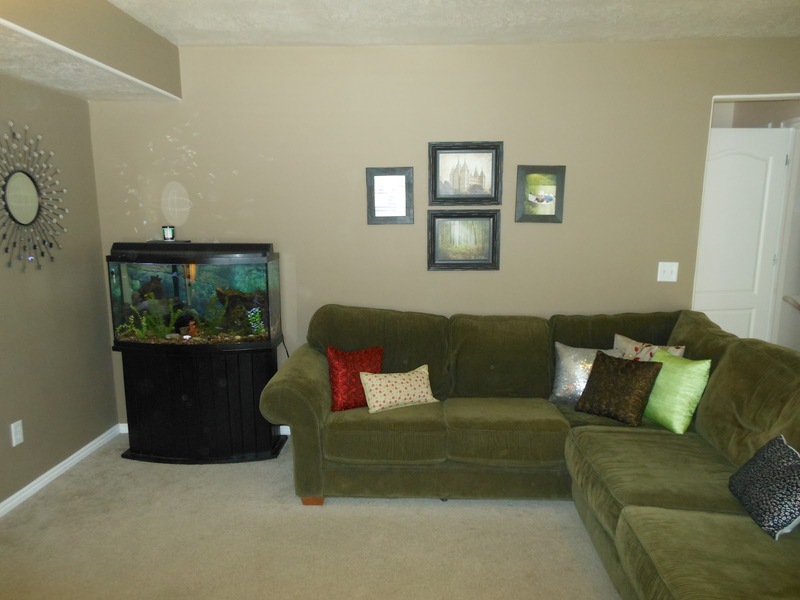 My client found a new fish tank in a nice black color. It was a lot cleaner look than the oak one that they had. And moving it into the corner serves as a pretty detail and also light in that darker area. Mrs. G also needed an area for her desk and computer. So it was angled in the corner and fits perfectly in the unused area of the family room. I really love this room. 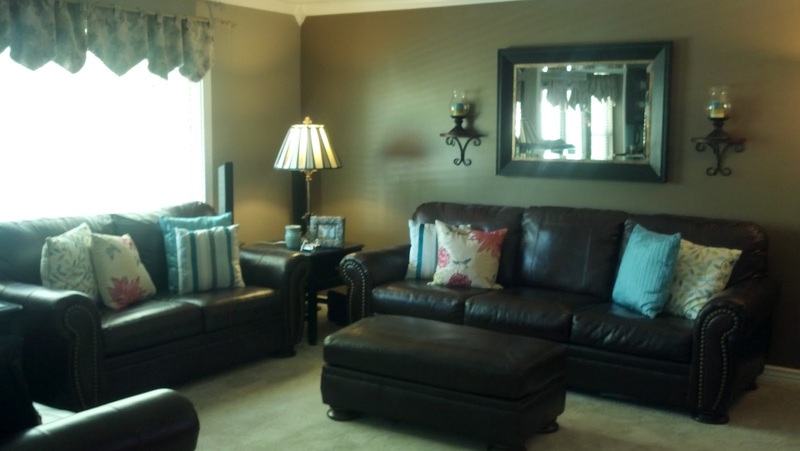 It is so calm and inviting, I know I'd want to plop down on that comfy sofa and watch a movie! 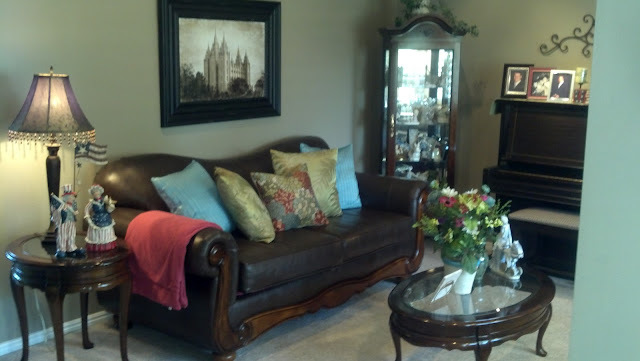 Thankyou Mrs. G for allowing me to come decorate another room of your beautiful home! 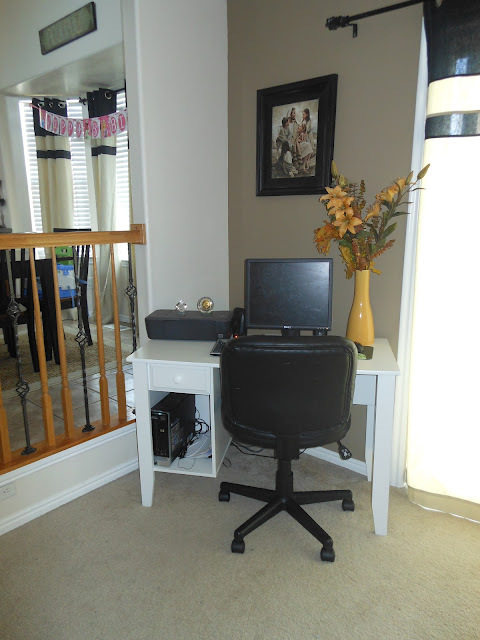 This is the before picture when I did the room re-design. I had taken pieces she already had to make the room more eye pleasing and functional. 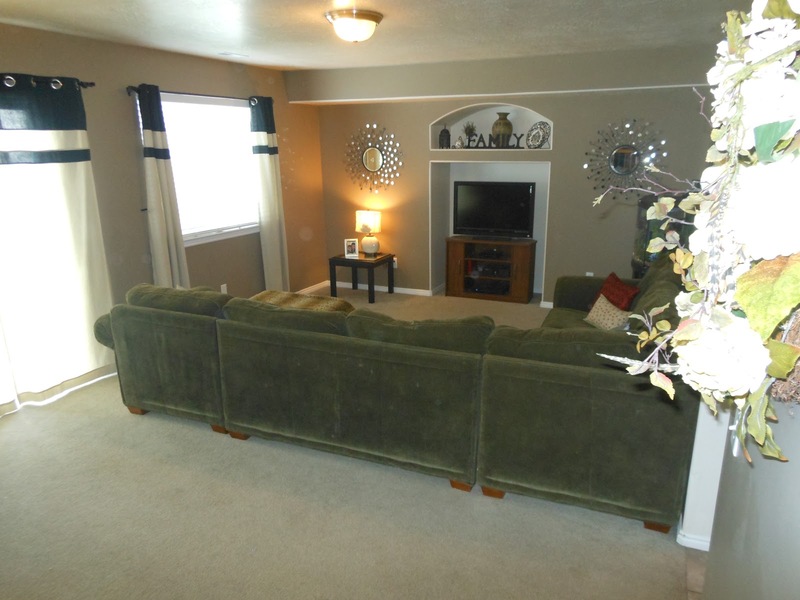 But as you can see by the above picture, its nice to spend a little bit of money on paint and decor perfect for this space. 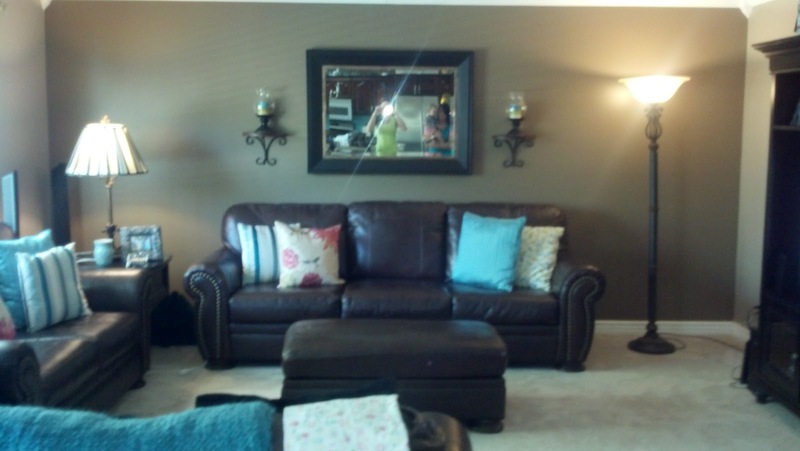 It is polished and finished now, and I know my client loves her new family room! I've noticed sometimes that its hard to find the exact item you want in a design. 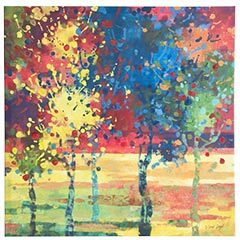 I had been on the hunt to find a perfect modern print to go in a room with reds, aqua's, yellows and greens. I knew I needed to find a piece with all those colors as the "inspiration" piece for the room. Well, I found an almost perfect painting... The dimensions weren't quite right and instead of aqua, the blues were much more of a royal blue color. So... I decided I'd take the canvas apart and would repaint over the existing canvas colors with paint that would make the perfect color palette. My little girl and I had a fun afternoon of finger painting the little dots on this canvas. The colors were now perfection. I decided to go to my local home depot and picked out molding and had them cut it to the desired dimensions I needed for a custom frame look. I used Masonite board as the backing and glued the canvas to the board and then used my handy staple gun to put the picture to the recently painted frame. I chose a metallic gun metal charcoal color. 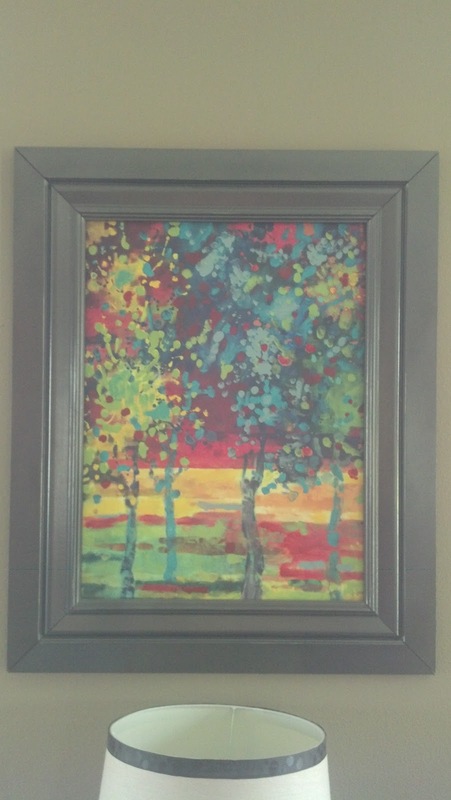 The picture is now a perfect color and scale to the room, and is the statement piece that is now a one of a kind piece. Do it yourself projects are actually a lot of fun and will give you a satisfied feeling every time you look at the finished project. I LOVE it when my clients call me back to come and help them "spice" up another room. I helped Mrs. R do a complete design project for her main level a few years back. 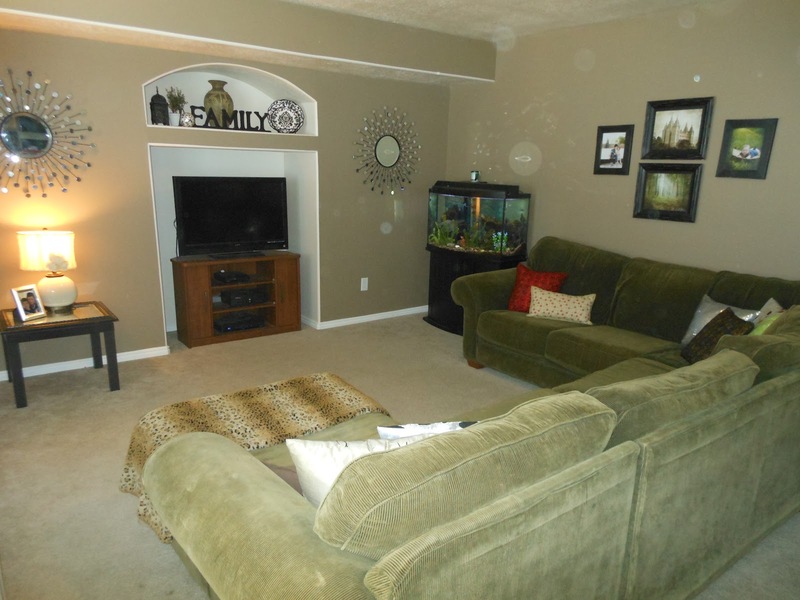 We did an overhaul from top to bottom, new carpet, paint, furniture, decor... the works! She wasn't quite ready to in-cooperate a bold color just quite yet. So I was so excited when she called and said she was ready for some color! And I was VERY excited when she said she wanted a dose of turquoise. 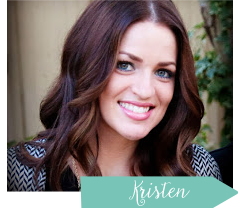 If you can't tell yet... turquoise is my favorite color! We had some fun shopping trips finding the right pieces to place in her beautiful home. I really like how her traditional pieces are given a modern flare with her new color scheme. 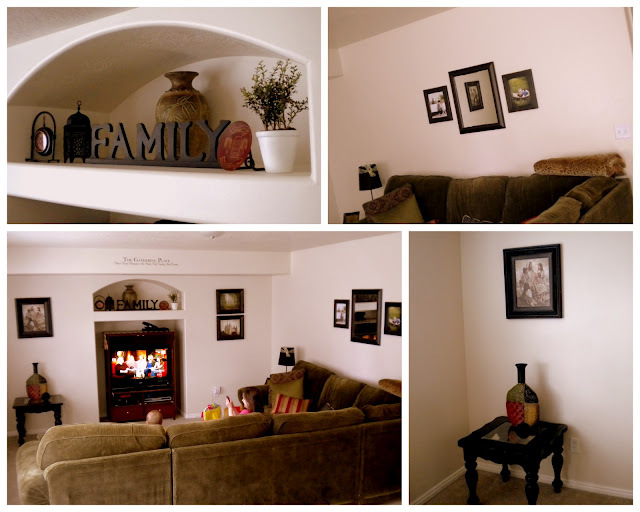 I love the result and I am happy to know that my client adore's her new updated space. She calls it "beautifully refreshing." I decided a splash of red and the aqua's would blend nicely with her very beige color scheme. 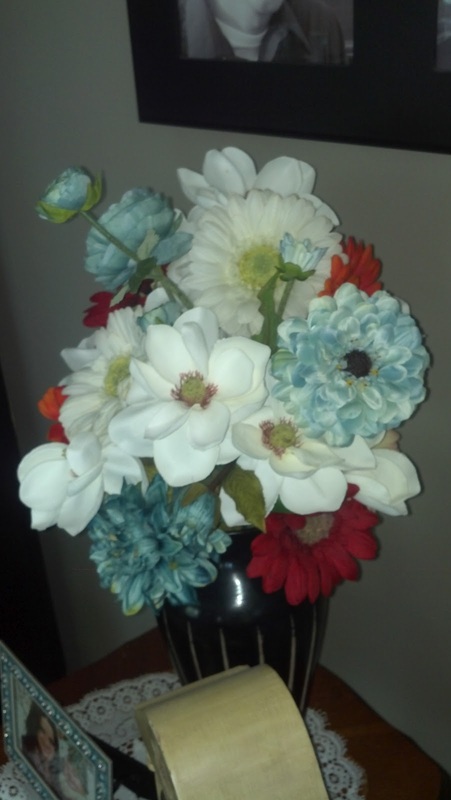 Mrs. R was very please with the flower arrangement I made for her. My client has some awesome antique's we in-cooperated. 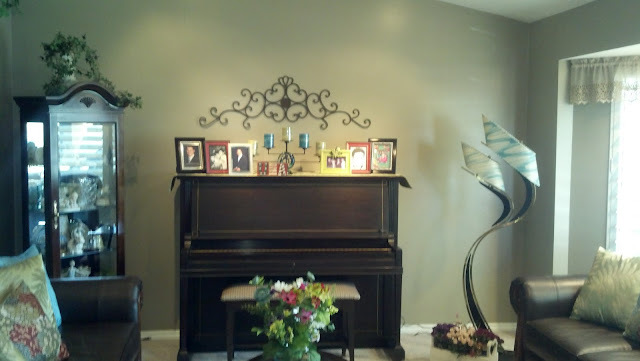 The piano, the swagged lamp and a lot of pieces in this room are passed down from her grandparent's. This is certainly a "keep sake" room. I love the turn out with mixing the fresh splashes of colors, bringing the old in with the new. 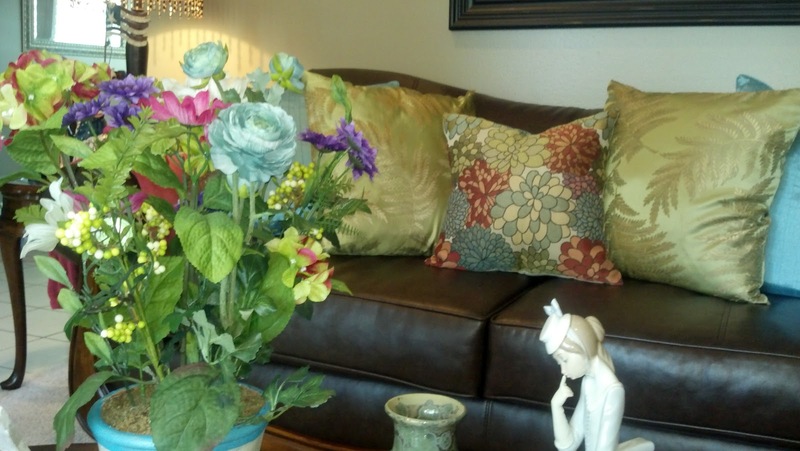 This is my client to a T.
And it just goes to show... a few decorative items completely changed the entire feel of these rooms. This is why I LOVE design.